Inverness Caledonian Thistle and Ross County are divided by little more than a dozen miles and the Kessock Bridge. So it's not too far for the bragging rights to travel once the dust settles on the first-ever Highland derby in the Scottish Premier League. 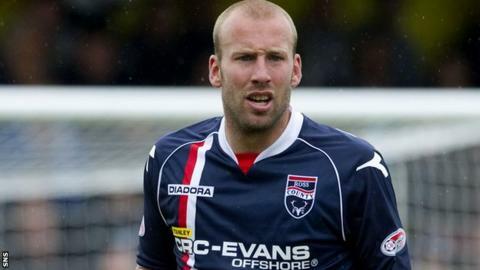 Terry Butcher's Inverness host newly-promoted First Division champions Ross County at the Caledonian Stadium. And the derby promises to be a cracker. Former Highland League side County, who were admitted to the senior ranks along with Caley thistle in 1994, have taken to their SPL debut season in style. "Both communities in Inverness and Dingwall are buzzing and the atmosphere is building rapidly," said BBC Scotland reporter Charles Bannerman. "This is a major achievement for football in the Highlands and been 20 years in the making. Here it is now: two teams facing each other in the SPL. "Everybody is expecting a great game. Before last Saturday, County were maybe the slight favourites. "But, on the other hand, last Saturday's results turned everything on its head with Caley Thistle's 4-0 victory over Dundee United. "And County went down 5-4 at St Mirren. That's made everything just too close to call. "There's a lot of SPL experience in that County team and a number of them with Caley Thistle; most notably Ross Tokely and Grant Munro, who left Caley somewhat controversially. "Although Derek Adams is new to managing in the SPL, he's been there as well. County have taken the transition to the SPL with great aplomb and it builds up for a wonderful occasion." Adams believes the derby will make for compelling viewing as both sides will boast players who bear the battle scars of previous derbies. "I would have to say this is the biggest of the lot; with the two teams playing in the SPL. "I don't think a lot of people would've thought that two teams would've got to the SPL and it's great that we're having this derby." "When you have players who have played in the derby before, they know what it's about and know what it's like to win a derby match. "We've got players that can play in the big occasion and players who have played in a Scottish Cup final. You need that experience and game knowledge to get through the match." Adams's opposite number, Terry Butcher, will watch the derby from the stand as he serves a one-match touchline ban. Butcher quipped that his players were doing cartwheels when they heard he'd be absent from the dugout. "Both teams want this fixture to be permanent and ensure we have these fixtures every year and that means both teams staying in the SPL," he said. "The way that both clubs are set up, and the way they get on, that can become a reality and we certainly hope so." It remains to be seen which side's supporters will be doing cartwheels at full-time tonight.